Oregon has some wonderful things to offer foodies, from FEAST Portland showcasing Oregon’s local products to the Columbia River Gorge breweries that span from Portland all the way over to the eastern corner of Oregon. Now I’m going to introduce you to the Hood River Fruit Loop, a cornucopia or fruit and veggie stands, breweries, wineries and food stands along the Columbia River Gorge, just south of Hood River, Oregon. I grew up in Oregon and I’m always excited to extol its virtues to anyone who will listen. If you haven’t visited Oregon, you’re truly missing out on one of Mother Nature’s best designs. Whether you’re taking a drive along Oregon’s 101 coastline, hanging out in downtown Portland or driving along the insanely gorgeous Columbia River Gorge, you’ll be rewarded with sweeping landscapes, mountains and trees, plus fruit orchards, vineyards and fertile farmland. You may not immediately think of Oregon as a place of great bounty, but it is, and no where can you better see and experience the true bounty of Oregon’s fertile lands than on the Fruit Loop near Hood River, Oregon. The loop is a 35-mile-long scenic drive that takes you from the town of Hood River and back again, as you loop south through pear orchards, vineyards and family farms. You’ll want to stop off dozens of times along the route, so while 35 miles doesn’t usually take that long to drive, you’ll need to count on at least 4-5 hours, possibly more, to even scratch the surface. Most people visiting the Fruit Loop from out of town are coming from Portland. It’s only about an hour away, so even if you’re just in Portland visiting for a few days, you can easily make this day trip. The best times to visit are from May to October, when the fruit and vegetables are at their peek and the roadside stands are full of beautiful produce. One important note before you set out – make sure you pick up a Fruit Loop Map so you know where all the stands are located and so you have a sense of direction when you lose service on your phone. You can pick up a map at any of the stops along the way, or at just about any hotel or business in Hood River. Here’s an online version of the map. Our first stop along the way from Portland to Hood River is always Multnomah Falls. The falls drop 620-feet in total among two different steps. It’s the tallest waterfall in Oregon and the second tallest in the nation. During the early spring months, the falls are at their peak dumping a tremendous amount of natural spring water and snowmelt and producing powerful plumes of mist for visitors to admire. It’s a quick stop to make – just pull into the parking lot and walk a short distance to the falls. You can also climb up a ways on a paved path to the bridge that spans the middle step of the falls. Or you can continue up on the trail about a mile to the top of the lookout. Opening Hours: Open seven days a week from 10 am-5 pm. If you’re coming from Portland on the Washington side of the gorge, you’ll need to cross over into Oregon, and the best place to that is at the Bridge of the Gods. You’ll pay a $1 toll to drive across the short suspension bridge. It’s an incredible view from the bridge! If you’ve seen or read the book Wild: From Lost to Found on the Pacific Crest Trail by Cheryl Strayed, you will recognize the Bridge of the Gods as the culmination point of her trip. Even if you’re already on the Oregon side (coming from Multnomah Falls, you can stop off at the Bridge of the Gods for a picture before heading onward. Location: Spans the Columbia River between Cascade Locks, Oregon, and Washington state near North Bonneville. 4 miles upriver from the Bonneville Dam. There are dozens of wineries to choose from in this area, so why did we skip the others along the way and head straight for Marchesi? Because Marchesi has everything you want in a winery. It has a beautiful patio and garden area to sit and sip your wine. 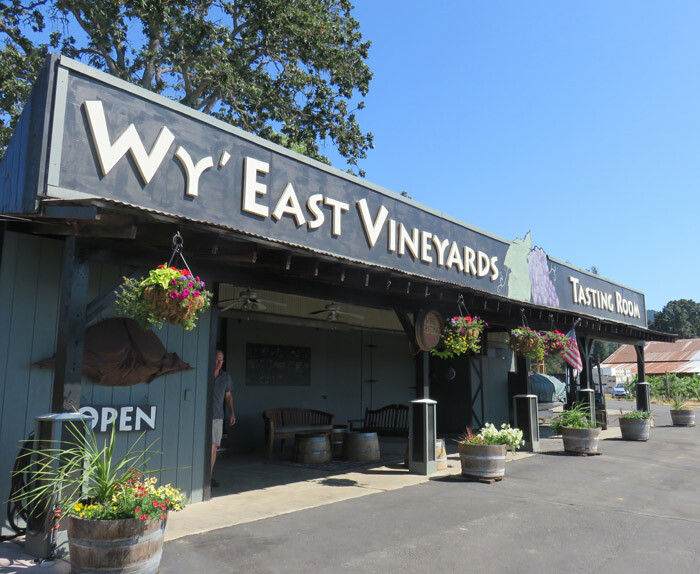 It has a top-notch wines (unlike a few that we tried in the area) and it has delicious food to go along with your sips, like the heaping plate of freshly sliced meat and cheese. We were given a heads up at the winery that Apple Valley Country Store had huckleberry milkshakes. If you don’t stop for one, you’re truly missing out. Along with local berries, you’ll find fresh and frozen fruit pies to take home, dozens of types of jams, jellies and spreads that you can taste before buying, lots of fresh picked fruits and all the knick-knacks you expect to find at a country store. On some summer weekends, there’s a BBQ going on outside where you can get some really tasty pork ribs, sandwiches and sides. Eat under the trees at the picnic tables with LIVE music in the background. If you’ve never been to a lavender field, this is a great chance to see the beautiful purple buds in bloom. Lavender Valley just planted a bunch of new baby lavender plants on their new grounds. They produce and sell lavender essential oils and other herbal products, plus honey that is harvested from beehives on the property. In the store, you’ll find over 50 different lavender products, and you can also pick a bouquet of flowers to take with you. If you didn’t get a chance to stop for BBQ at the Apple Valley Country Store, there’s another opportunity in the town of Parkdale. Apple Valley BBQ is located right along the main road, across from the historic train station. The menu is extensive and the BBQ is really good. We ordered a plate of ribs and a pulled pork sandwich with a side of BBQ baked beans and coleslaw. Everything was very tasty, and the portions were large. You can choose to sit inside or at the picnic tables outside. In Hood River, there are a hundred and one amazing views of Mt. 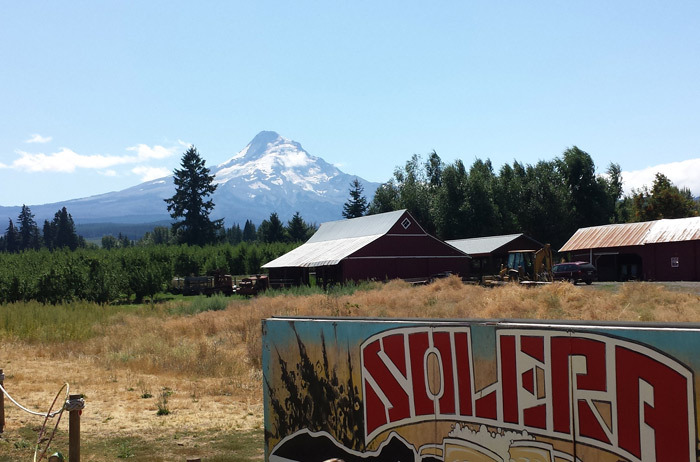 Hood that you can admire from just about every bend in the road, but one of the best views can be found from the outdoor beer garden at Solera Brewery. Solera is a small craft brewery specializing in unique and creative small batch beers, like apricot wheat, a sour wheat and a cider-infused ale. They also serve food – a good selection of soup, salad and sandwiches. The atmosphere is laid back and easy going. It’s a great place to grab a beer midway through the Fruit Loop and just enjoy the nice weather and the great view. This is your go-to stop for fruit. At the farm, you can pick the fruit yourself straight off the tree, or you can just pick up a bagfull that’s already been picked. They have many varieties of cherries, peaches, nectarines, pears, prunes and apples. On busy weekends, they have a bunch of varieties of fruit cut up in bowls to try before you buy – but believe me, you’ll want to buy one of everything. 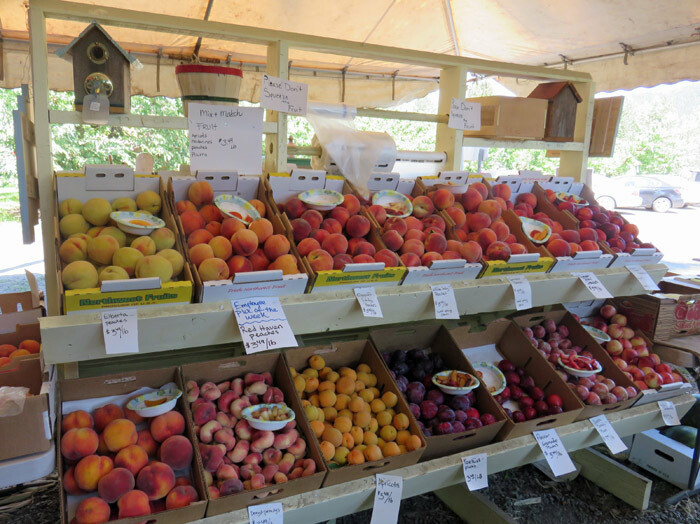 We were lucky enough to try a dozen or so varieties of peaches while we were there. I didn’t even know there were that many! It’s the perfect little country store, packed with local products – jelly and jam, meat products like lamb and goat, and other kitschy items to purchase. By this point in the journey, you definitely need to stop for another glass of wine! The Wy’east Vineyards is the perfect place to do that. 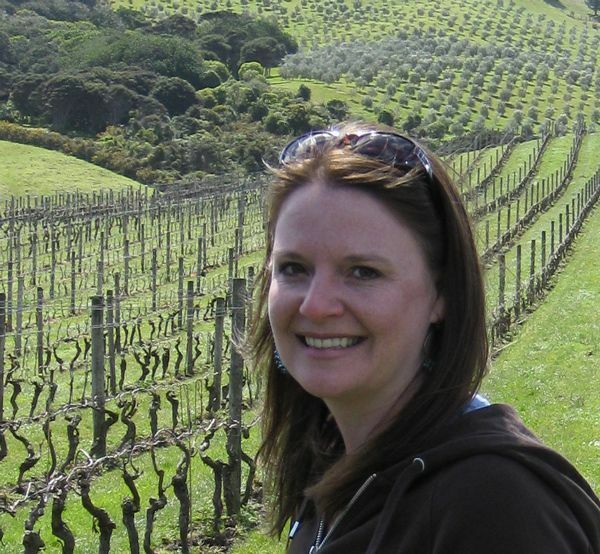 It’s a small, family-owned and operated winery. The name derives from the Multnomah Indian tribe’s name for Mt. Hood, Wy’east. The tasting room has a lovely patio off to the side that is shielded from the parking lot and the road. You’ll want to park yourself in one of the relaxing chairs and spend an hour or so tasting wines or sipping on a glass of their Chardonnay or Pinot Noir. While you might stop off at a few more of the fruit stands along the road back, we think the best way to end your tour of the Fruit Loop is at the Hood River Breweries located in the town of Hood River. 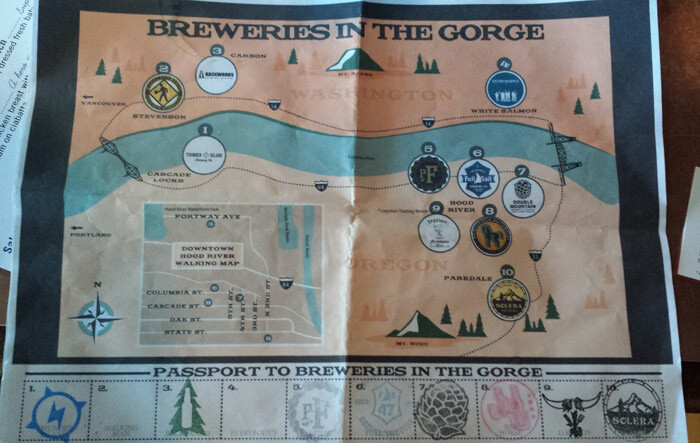 The Breweries of the Gorge organization is made up of 10 breweries in and around Hood River. If you find one of their brochures (you can print one here), you can take it along with you to the breweries. If you visit at least 8 of the 10, getting a stamp on your passport, you’ll receive a collector pint glass at the end. We had a great time going around to each of the breweries and seeing what they had to offer. All of them have taster trays so you can get a sample of each beer without having to indulge in a full pint. And to our surprise and enjoyment, they all have food as well. Some of our favorites were Full Sail, Pfriem and Backwoods Brewery. These are only 10 stops along the official Fruit Loop. But there are dozens of others to stop at, but even making it to these 10 is a full day of adventure, so this is a good place to start! Have you been to the Hood River Fruit Loop? Tell us what your favorite places are to stop along the way. This entry was posted in Things to do and tagged Oregon. Solera Brewery sounds like my kind of place. You can’t beat a delicious brew with a view! We haven’t had the chance to my our way out to Oregon yet but it’s at the top of our list of places to visit back in the U.S. This is sucha great guide! 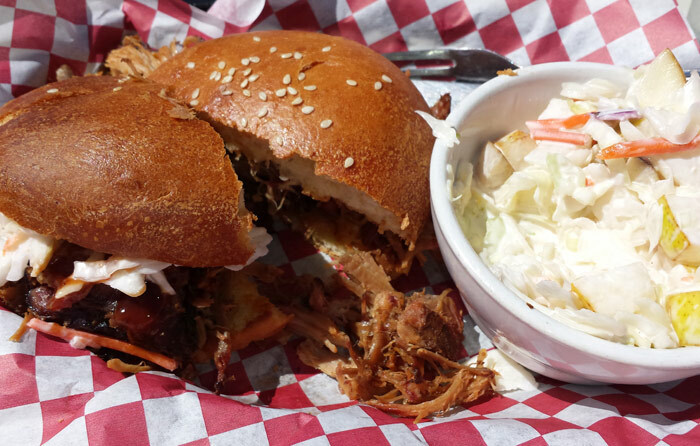 Was that pulled pork sandwich as tasty as it looks? On my summer road trip I couldn’t convince the kids to pass through the Gorge on our way to Portland. They were on a mission to see the top ten things from Yelp in PDX!! So wish I’d had your post to share and convince them of a little of what they missed. Oh no, Elaine! You guys totally missed out! The gorge is incredibly beautiful, just for the drive, but there are so many great things to do – almost better than Portland. Based on experience, I know I’d go crazy picking fruits at places like Draper Girls Country Farm. The experience + the price of fruits (usually cheaper than in the markets) definitely make it worth a stop. We do too. I mean, we don’t need 20 apples and 15 peaches. There are only 2 of us. But it’s so fun to pick them! What a wonderful day trip – I wish I had come along for the ride. Reminds me of driving through the vineyard areas close to San Diego where I used to live. Good times! Wow… great post. Like the pics specially Multnomah Falls. Awesome. Have shared it on twitter as well. Thanks Himanshu. I love it when people share! Oh wow! I haven’t done something like this before. Sounds really fun, especially the eating part. The Fruit Loop area is one of my faves in Oregon! I always hike up to the top of Multnomah Falls and then head over to Apple Valley BBQ and Solera Brewery for much needed refreshments. Thanks for the walk down memory lane! Sign me up for the brewery tour. I love getting to tour breweries and try all the different beers. And plenty of healthy fruit to make up for all that beer. We love doing that too, Jennifer. It’s fun to try what breweries are making, especially when they have unique beers.